The ILA Berlin Airshow is a prominent airshow and trade show in Western Europe. Netting around 1,200 trade exhibits on average and nearly a quarter of a million attendees, the Berlin airshow is located near the heart of global aerospace giant Airbus which encompasses many subsidiary components. The Farnborough air show is held biennially on even-numbered years, so this is the year to attend. In 2012, about $72 billion worth of aircraft sales were agreed upon at the event, so there is serious currency being exchanged at the event. While Europe does not lead the world in aerospace growth (China fairly dominates world growth), the top two airshows convene there which is no coincidence; many of the major market producers are located in Western Europe. Asia’s largest event in the aerospace industry, the Singapore airshow is another biennial event which draws nearly 100,000 visitors. Reported deals have averaged nearly $30 billion since 2012, with several dozen agreements between customers and vendors of unreported values. It should be recognized that Asia-Pacific is by far the fastest growing and largest market segment in the world, so whether you are buying or selling, the largest airshow in the region should be a ‘must attend’ on your itinerary. No congestion from air show goers who are not in the industry. No clutter from aircraft and aerospace manufacturers which are not in the ground handling arena. Attention is finely focused on ground handling matters, equipment, and trends, and nothing else. The Americas event is held in beautiful Miami, Florida, in June of each year. While in terms of shear numbers the GHI events are not in the same league as the huge air shows listed above, with deep-pocketed sponsors the likes of DHL and Textron there is certain to be solid business available. Again, to re-emphasize the previously stated, people attending niche trade shows like this generally come with the intent to purchase. The Americas conference in Miami is only one of GHI’s conferences; they also host conferences in Singapore, South Africa, and Ireland, so the interested parties across the globe should be able to find one conference which will fit their travel constraints. Aviation Week is widely known as one of the most reliable resources in the aviation industry. Aside their flagship weekly publication, Aviation Week and Space Technology, the Aviation Week Network hosts numerous events worldwide, including the MRO aviation expos in Europe (both Western and Eastern), Asia Pacific, Latin America, Americas, East Asia, and the Middle East. These trades shows focus on the maintenance side of aviation, and bring in premier vendors in the market, available for immediate support and sales. While this is hosted and presented by Aviation Week which has been previously cited, it is included because of the very important niche which it represents. The military is an enormous client base of ground support equipment, particularly aircraft tugs, so an aviation expo dedicated just to the military needs to go under the ‘must attend’ list. The U.S. military alone employs tens of thousands of pieces of GSE, much of which is very outdated and towards the end of its life cycle. If you are a military representative looking for the best collection of vendors to suit your purposes, this is going to be it. The symposium is made up of 75% vendors and 25% active military, so the odds will be highly in your favor to find what you need. While not an aviation expo in the same thread as dedicated air shows and trade shows, this summit may be equally as important, if not moreso. Jane’s Information Group has long been the gold standard of intelligence and information in the defence and aerospace industries, so when they host a summit strategically located in a global hotbed of aviation activity the likes of Abu Dhabi, industry professionals will do well to make their best effort to attend. Summits of this calibre are where the direction of aerospace are revealed and refined, and attendees will be on the absolute forefront of the change. EAA AirVenture is definitely the most iconic fly-in and airshow in the world. Along the same lines as the Global Aerospace Summit in Abu Dhabi, it is a broad-view sort of event with the focus being on experimental aircraft, warbirds, and acrobatic displays. That being said, whenever there are over half of a million aviation geeks in close proximity to each other, the settings are right to display your cutting edge wares. Conversely, potential customers will find nearly 800 commercial vendors at the event. 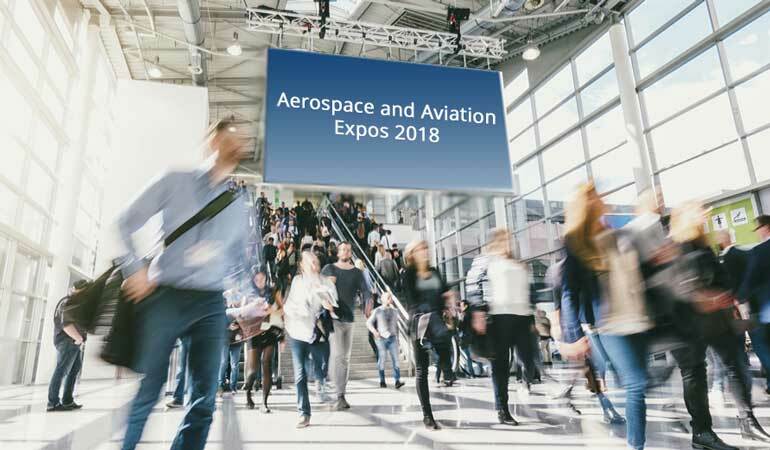 While this is definitely not a dedicated aviation trade show or aviation expo, the atmospherics are perfect to provide or find nearly anything aviation available, all while enjoying one of the best air shows in the world. The National Business Aviation Association, or NBAA, is a heavyweight lobbying organization in the U.S., and their business focus carries over well to MRO and ground handling vendors. Their annual convention, held every October in lovely Orlando, hosts over 1,100 indoor vendors, and the opportunity to connect with some 25,000 industry professionals. If your scope of operations falls anywhere in North America, you will immediately understand the importance of attending any convention hosted by the NBAA because they are that significant of a force in business aviation. This is absolutely a must to attend if for no other reason but to get your name out to the community. There is no way to make this list inclusive because there are so many dedicated aviation trade shows and aviation expos all over the world. This is meant to serve as a guide to the most prominent events, those with the broadest scope and impact. Which aviation expo are you going to visit in 2018? Tell us in the comments below! You want to get some helpful information upfront? Get our free eBook on ground handling now!